Hello!!! I hope everyone is doing well and getting ready for Thanksgiving, which is just a few days away. Since it is a American Holiday that means that here in NL it is a normal working day and everyone I know will be working. 🙁 What I decided to do is to celebrate Thanksgiving a bit later this year, this of course would be nice if I am able to find Turkey in the market in my area. (which is close to impossible) If not it doesn’t really matter we will still be celebrating with a few side dishes, appetisers, salads. So, I am only human, and well these things do happen to all of us. I will definitely make this recipe very soon and I do hope the second time around I do not drop it. Start off by boiling the broccoli for about 5 minutes and rice (normal cooking time) separately. Set aside when done to cool off. In a large bowl add in all the ingredients (except for the broccoli) and stir. The next step is to add in the broccoli and stir very slowly. 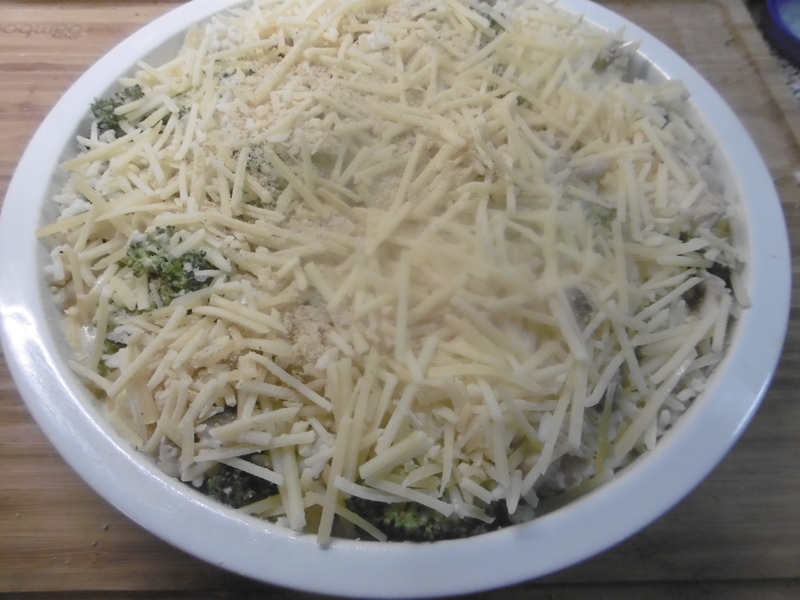 Place the mixture in a baking pan and top with the breadcrumbs and cheese. Bake at 180 degrees or until golden brown. Wonderful rice dish! Love this delicious cheesy rice loaded with nutrients. Last week, I dropped a tray full of cookies into my freezer. They fell underneath the drawer so I had take out the drawer and its contents in order to retrieve my cookies and the tray. Lol 😂 Your recipe sounds great and I’m glad that you posted it because it would be worth making. Yummy! This is a great rice dish, Sophie! I'll have to bookmark this one, but it's so hard to get broccoli here! Hi Diana, thank you so much...I sometimes grow my own..a few seeds and a couple of weeks later I have 2 broccoli heads. You're utmost welcome, Sophie! I'll have to hunt down broccoli seeds then!